I've been plugging away at restoring my vintage stove. As I've been working on it and have had a chance to compare my stove to other Tappan Deluxe, it has become apparant that my stove is one of the earlier versions of the Deluxe (more on this in an upcoming post). I'm now guessing 1948 or 1949. 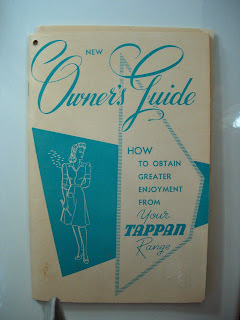 The Tappan Deluxe Owner's Manual I purchased off of ebay was published in 1953. 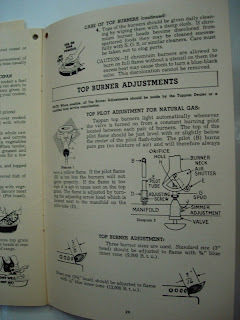 It has been very helpful and almost all of the information applies to my stove, but it dawned on me that I also might benefit from an older Tappan Owner's Manual. 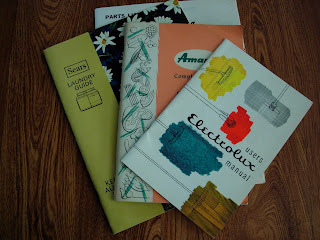 So, one night I was trolling ebay and ran across a lot of old appliance manuals for cheap. Most of them were from the 1960's & 70s, but I was pretty excited to see a late 1940's Tappan stove Owner's Guide in the lot. I was the only one to bid on the manuals. My ebay purchase arrived last week. This older Guide includes all of the info. that appears on the 1953 version....and a much more detailed section on how to calibrate the thermostat and adjust the pilot, as well as the stove and oven burners. Presumably someone used this info to blow up their house and/or family and it was later deleted from the 1953 edition. 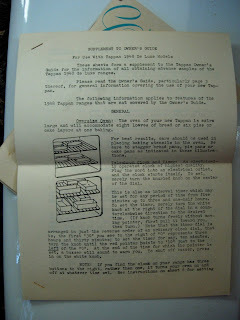 There is also a charming typewritten additional section for 1948 Tappan Deluxe owners. I am pretty certain that I now have the Owner's Manual situation pretty well covered. I still have been searching (in vain) for a Tappan Deluxe Service Manual. A dream come true would be a service booklet with illustrations of parts and assembly. I know Chambers has one for their stoves, but I can find no sign of such an animal existing for the vintage Tappans. The whole finger injury has taken it's toll on project progress this summer. When it was all said and done, the entire medical bill came to just under $1000. Yeah, half for the initial urgent care experience....and half for the hand specialist follow-up. I have a HSA medical plan, so that fine amount comes directly out of my wallet. Sadly, it is roughly the same amount as new wood storm windows for my upstairs windows. Oh, well. What are ya gonna do? The finger itself is healing well. The top of it actually fell off. I went through a phase where it freaked me out to let anyone near the finger, so I took out my own stiches. The nail bed regrew and a new nail grew out of the bed and reattached itself. Men will not turn their heads in horror and small children will not run in fear. The weird thing is that the nerves are still growing back. The feeling in the finger gets a little better every day, but right now the finger has a very heightened sense of feeling at the tip. If I run my finger through my hair, each strand feels like yarn. That said, the thought of putting that finger anywhere near a heat gun or paint stripper sends shivers down my spine. Can't do it. Sadly, stripping the paint off of my wood trim on the exterior of my house was supposed to be my big project this summer. We'll see. Ever the optimist, I did buy a gallon container of ZipStrip this afternoon. I think I chose the hottest, most humid day to decide to go get mulch from one of the nearby free city mulch piles to use on the side of my house. 6 - 18 gallon bins full. It was not a pretty sight. I dug up a gazillion hostas earlier this summer and the bare dirt was growing a nice batch of weeds. My poor neighbor has been looking at my peeling paint trim for a year now....he didn't need to be subjected to my weeds too. The remaining black-eyed susans should be blooming soon. 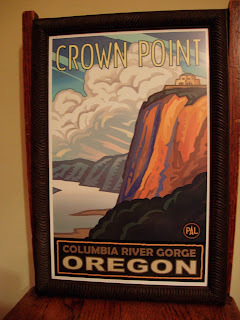 I was sorting through some older photos and ran across this pic of the second print I picked up on my last trip to Portland....framed. I think I forgot to post this one when it came back from the framers. Same artist, obviously, as the first. Very bungalowish, I think. One of these days I may actually get them on my office wall. This afternoon I spent some time cleaning, sanding and painting the underside of my stove top and the oven exhaust back panel. 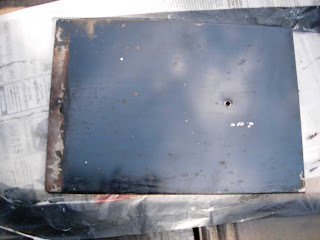 The sections around the burners were rusted and paint was chipped off the end of the oven exhaust panel. Here's a little of the thought process I used on the top. 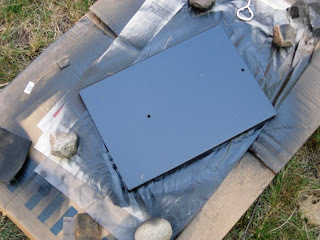 First, the facts: I know there are companies out there that will reporcelain stove parts. The underside of the stove top was originally black speckled porcelain. The companies that are experienced with working on vintage stoves are out-of-state. The cost of shipping combined with the actual reporcelain work will be a pricey project. There is a corner on the top side of the stove top where the white porcelain is chipped. This doesn't really bother me, but it might be nice to fix this at some point. Eventually, I may decide to send the top away to have both top (white) and bottom sides (speckled black) reporcelained. I'm in no hurry. Next, the decision: My approach in working on my house is to "do no harm." This means not making any significant changes that can't be later undone. Same goes for the stove. 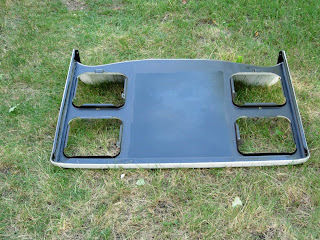 That said, I decided to paint the rust on the underside of the stove top...for now. 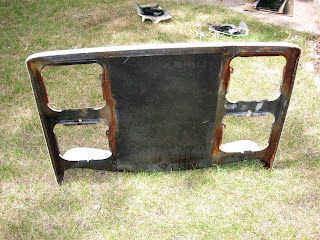 This will: a) stop the rust; b) allow me to use the stove now; c) permit the stove top to be reporcelained in the future. 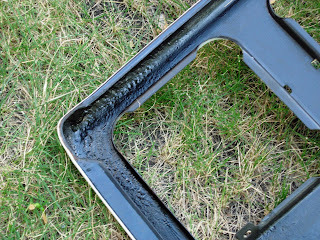 The paint you see on the bottom of the stove top is only the first coat. I'll pretty up the lines with the next coat. Who knew finding the 4-prong to modular adaptor would take longer to track down then the actual vintage phone? 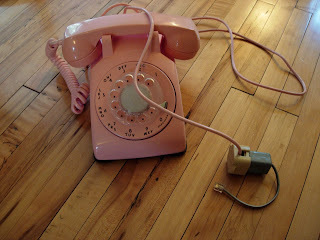 The goal was to keep the original, pink cord. I've spent months since buying the phone looking high & low for this adaptor (or an actual 4-prong jack). The kid working at Radio Shack didn't even know phones once came with 4 prongs :-) Salvage places told me stories of the hundreds of jacks they had thrown away. 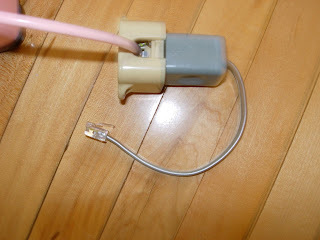 The adaptors online were selling for more than I paid for the phone. Just couldn't do that. Anyway, finally, here it is. Just a quick post on the progress of restoring my vintage Tappan Deluxe. 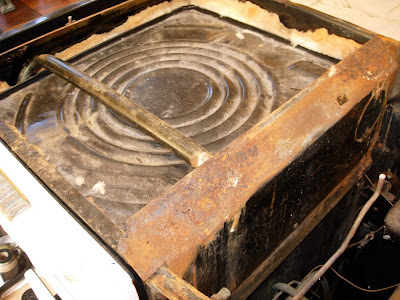 I have the top of the stove off and have sanded the light rust off the underside of the top. This will be painted shortly. The weather has been humid here, so I haven't been able to paint. With the top off of the stove, you can see the old oven insulation. I removed two layers of the old insulation which I will replace with new. You can now see the gas manifold pipe that runs from the back of the stove to the front burners on both sides of the stove. It's in excellent condition (thankfully). 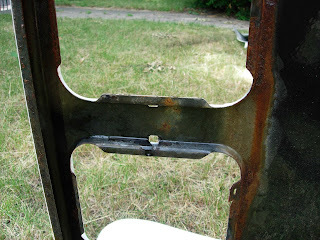 The two metal pieces on either side of the insulation space need to be removed, cleaned & painted. They are probably the most rusted pieces of the stove, but they still aren't too bad. Once that is done, I need to decide how much of the oven I want to expose. There really isn't a need as the insulation on the sides of the stove appears to be in good condition, and because this area was closed off it really doesn't need to be scoured or treated in any way. Then again, all new insulation around the stove would be nice. And just knowing that I cleaned every inch of the stove would make me feel good. The little voice inside of my head is still debating....just take it all apart....or leave well enough alone. I received the Tree Guy's estimate and sent in a signed contract. This is the (new) tree guy I called a few weeks ago while waiting for the handyman not to show up (yes, I'm still a little bitter). I have two massive oaks in my backyard. Massive. The trunks are maybe 10' around. One of them has 4 or 5 huge braches that have died. Like my sewer, this is something I really don't want to spend my money on, so I've been stalling. A few years ago, part of one of the massive branches came hurtling down into the yard. Thankfully no one was outside at the time because it came down with such force, half of it buried itself two or three feet into the soil. We needed a chainsaw to get that thing out. For a while after that, getting those branches taken care of was top priority, but as with many things the fear subsided and it moved to the back burner. Which brings us back to the Tree Guy. He came out and looked at the tree. He told me it's "shedding branches." It is not dying. (much to my relief - I don't even want to think about what it would cost to remove the entire thing). He informed me it was a red oak and probably 200+ years old. We agreed on a price. He can't trim the tree now for fear of oak wilt, but we scheduled it for late summer. Check that one off the "To Do" list. Then I walked him around to the front of the house and showed him my most-hated cedar tree. I asked him if he could do anything with the tree to make it less hideous. He paused for a moment and then told me if it was his tree, he'd cut it down. Words of joy to my heart. I was afraid he was going to tell me that it was a valuable tree that should be saved at all costs. We agreed on a price. Haha....so, the overgrown cedar tree's days are numbered too. A couple of years ago, I had sidewalks added to the front half of the side of my house. 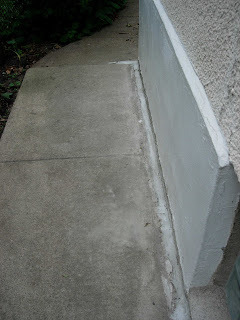 The back half of the side of the house still had vintage sidewalks in good condition, so I let them be. Over the years, those vintage sidewalks had worked their way out an inch or two from the foundation wall. Or maybe they were poured with a gap. Who knows. At any rate, water had created a gap clear down the side of the submerged foundation wall. One of the PO's tried to patch the area using stucco patch. It was pretty ugly, but did the job for a while. 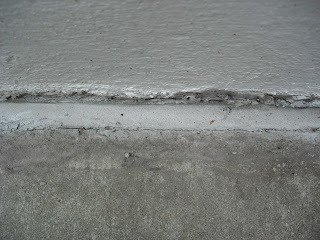 Then the whole thing started to crack and every year I went out there and filled the cracks with caulk. My caulk repairs went on for years until the caulk was really the only thing holding the whole thing together. Last week my dad came over and helped me pull out the old patch, fill the gap with compacted sand and patch the top 1-2" with patching cement. This should keep water and other crap from seeping down the side of the foundation. Obviously, I still need to scrape off some old caulk and repaint the foundation, but the whole thing looks much better now.